Viewing topic "Motif Rack XS sound"
So i was jus wondering when this VSTi editor does finally come out, if I have it installed and Im using the VSTi editor in whatever DAW im using, I should be able the hear the MOtif Rack sounds through my speakers that i have connected to my computer right? No. Not really. The Motif-Rack XS VST Editor will be the first VST3 Editor for a hardware synthesizer. It does not replace the need for a Motif-Rack XS, nor does it replace the need for an audio interface. The audio interface that you use will determine where your sound is heard. If you have a standalone audio interface, like the AudioGram units or the scores of others available, then your sound will come out of the device that is your audio interface. Typically you connect the speakers to the audio OUTPUTS on the audio interface. If you have the mLAN16E2 installed in your Motif-Rack XS this will allow the Motif-Rack XS to be your audio interface. And the same thing stands: the speakers would be connected to the audio outputs of the device acting as your audio interface. 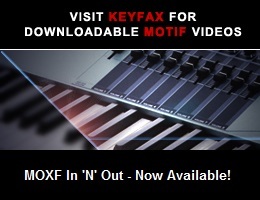 The only time the sound of your Motif Rack XS would come out of the speakers connected to your computer, is if you computer is acting as your audio interface (yikes)… most software programs would warn you against that… for any serious recording. If you have a soundcard in your computer… the same thing holds true… since that soundcard is acting as your audio interface, quite naturally you would connect the speakers to that device. Make sense? The device acting as your audio interface is responsible for routing audio into and back out of your computer. If that device is external then connect the speakers to that external device. If you are using the soundcard in your computer quite naturally connect the speakers to that soundcard.